I attended the Stitch and Craft show on Friday 20th March with much anticipation of the goodies to be found and the joy of learning something new at the workshop I had booked. I was reserved in my purchases but am thrilled with what I have chosen as almost each item is completely new and different to me. 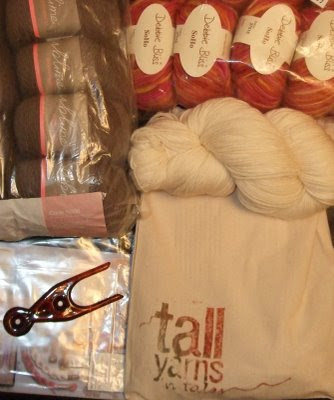 A kit to dye my own yarn and then make into a beret. Some gorgeous Angora mix yarn for a wrap around top. A Lucet kit for making traditional cord and all the instructions too thankfully. 10 balls of SoHo to make some more bags. I attended a workshop on continental knitting which included a ball of very different fancy yarn (struggling to knit it so far but will persevere). Unfortunately the workshop was very very disappointing and I have turned to the old faithful web to satisfy my curiosity. I can now say that I 'get' continental and with practise would probably quite enjoy it too. Suffice to say that a letter of complaint re. workshop is being drafted now. Update - complaint has been dealt with incredibly promptly by twisted thread and they are sending me a full refund by post. Yay!